Discussion in 'Nodes' started by Info, Nov 5, 2018. What’s A Witness Node ? Witness Node — A block producer node for the Crypviser Network. The term witness was chosen because it is a legally neutral word that is free from regulation. Traditional contracts, for instance, often have a place for witnesses to sign. For extremely important contracts, a public notary is often used. Neither witnesses nor notaries are party to the contract, but they serve a very important role of certifying that the contract was signed by the specified individuals at the specified time. In the Crypviser Network, witnesses serve a similar role of validating signatures and time stamping transactions by including them in blocks. The main purpose of the witness is to collect transactions, bundle them into a block, sign the block, verify and broadcast it to the network. They are essentially the block producers for the underlying consensus mechanism. How much I can earn as a Witness Node? For each successfully produced block, a witness is paid in CVT from the reserves pool at a rate that is defined by the Crypviser Network. The current defined rate per block is 2 CVT, but may vary dynamically dependant on the monthly subscription fee of the Crypviser service and the CVT/CVN public market price. With the current network load of 8 witnesses the average income of a witness node is approx. 2000–2500 CVT / per month.Of course this is an approximate amount, and may vary depending on the total registered witness nodes and user base. How does a Witness Node produce a block? The number of Witness Nodes (block producers) in the Crypviser Network is limited to a maximum of 40 nodes in 2018. The priority to run a witness node (up to 20) will be given to the CVcoin Foundation members. 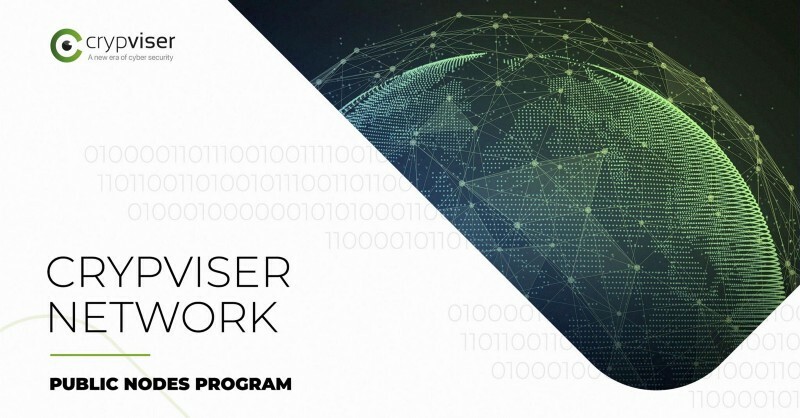 To become a witness of the Crypviser Network the applicant should hold at least 50.000 CVT/CVN on the account.For Crypviser Community members the required amount is 25.000 CVT/CVNA Community Member is a person who has been holding any amount of CVN as of 1st July 2018. These funds should be deposited to special multi — sign Bitshares wallet, protected by the keys of Crypviser and witness applicants. It guarantees that such funds will be blocked as long as the witness node is in an active mode. The deposit would be refunded after stopping the witness node activity. Crypviser will be accepting applications to join the Witness Node program starting from 22th November 2018. Registration Node — it’s a public node which is used to register new Crypviser accounts and provide access to the Crypviser Network. The number of these nodes are unlimited and play an important role for the Crypviser eco — system. The Crypviser App registers new user through such nodes. It’s crucial to have Registration/Access point nodes in different countries to ensure a fast, reliable, and unblockable access to the Crypviser Network. The one-time setup fee of a registration node is 500 CVT.The registration node gets rewarded 10% from the paid subscription period of new registered users in CVT. Every time a user pays the subscription fee for a chosen period the registration node will be get rewarded. Crypviser Network applies PoS (“Proof — of — Stake”) consensus to choose the registration node which will be used for registering new accounts. It means that the TOP 20 holders of CVT running registration nodes will get priority for registering new users for every geographic region/area. The active list of TOP 20 registration nodes is sorted once every maintenance interval (1 day) according the holding stacks (higher first). If a registration node is not active/suspended or fails to register an account it will be blocked temporarily, and the turn will be passed to the next node for the selected area/region.